Click here to find events near you! 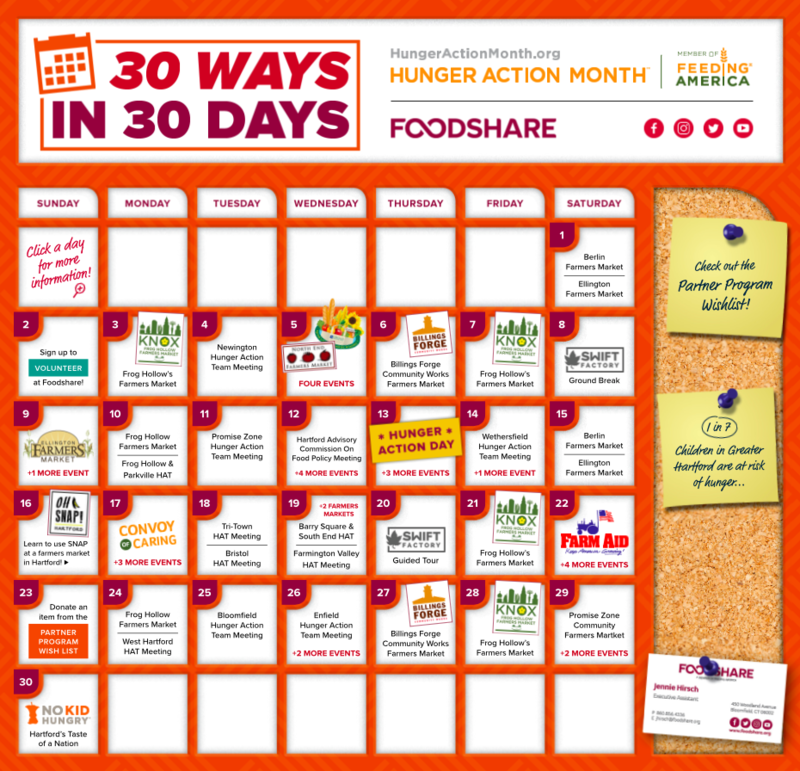 There are several local events Foodshare, the Connecticut Food Bank, and End Hunger Connecticut are sponsoring this month that you can attend to fight hunger in your community. There will also be the Hungry for Change Fall Conference on September 20 from 8 a.m. to 12:30 p.m. at the Chrysalis Training and Conference Center located at 255 Homestead Avenue in Hartford. The conference will feature Hugh B. Price, an activist and former President of the National Urban League and author of This African-American Life: A Memoir. Topics of discussion will include using data and community voice to raise awareness and support for the issue of hunger, updates on the current state of federal nutrition programs and nonpartisan ways to get out the vote in November. Be sure to register by September 14 for the conference event. Throughout September, Foodshare will be hosting local events to aid community members in the fight against hunger. The "30 Ways in 30 Days" calendar below has a list of events happening in your community you can attend.